The Red Starfish generally lives alone, but if the aquarium is large enough to support more than one, it will tolerate others of its own species. It requires a mature tank with algae and is generally fairly self-sufficient in the aquarium, finding enough micro-organisms and detritus to scavenge if live rock is present. It is diurnal. 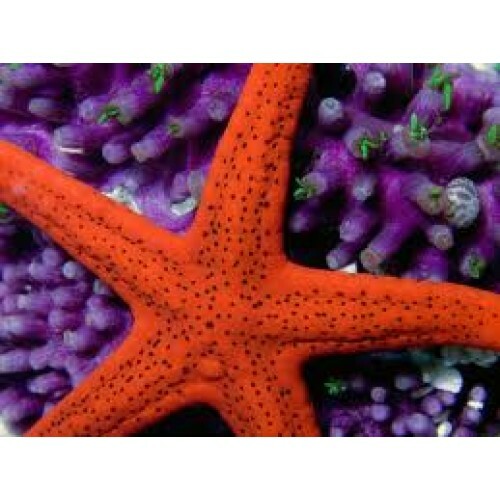 The Red Sea Star is very intolerant of sudden changes in oxygen levels, salinity and pH of the water, and cannot tolerate copper-based medications. The drip acclimation method is highly recommended for all Sea Stars due to their intolerability to changes in water chemistry. It should never be exposed to air while handling. The Red Sea Star is extremely difficult to breed in an aquarium, with no distinguishing characteristics to help differentiate it from its mate. If there is insufficient algae growth in the aquarium, the diet should be supplemented with flaked foods, and small pieces of fish or mussel.